(RxWiki News) Shingles is not just seen in the older population. Young adults can develop this condition, too. Here's what you need to know. Shingles is a painful rash on the skin caused by the varicella-zoster virus. A shingles rash typically appears as a single stripe of blisters wrapped around either the left or right side of your face or body. The virus that causes shingles is the same virus that causes the chickenpox. After you get chickenpox, the virus remains inactive in your body even after your infection is treated and gone. For reasons not fully understood, it can become activated later in life. Shingles itself is not contagious and is typically not life-threatening. The virus that causes the infection can be spread, however. The issue arises if you did not have chickenpox or the chickenpox vaccine. You can get chickenpox from interacting with someone with active shingles. If you had chickenpox in the past, you are at risk of getting shingles. The risk increases as you get older — the condition is most commonly seen in individuals older than 50. Having a weakened immune system can also increase your risk of getting shingles. Some of the conditions that can cause you to have a weaker immune system include HIV and AIDS, certain cancers and immunosuppressive drugs. The most common sign of shingles is a painful rash that appears in a stripe of blisters on one side of the face or body. Before you see a rash develop, you might develop pain, itching or tingling in the area where the rash will likely appear, usually one to five days before. The blisters scab over in seven to 10 days and usually clear up in 14 to 28 days. You might get some other symptoms associated with shingles, such as fever, headache, chills and upset stomach. Talk to your health care provider immediately if you think you may have shingles. After a shingles diagnosis, your doctor may prescribe you antiviral medications like acyclovir, valacyclovir or famciclovir to shorten the duration of the attack. These medications are most effective if taken within three days of seeing a rash develop. 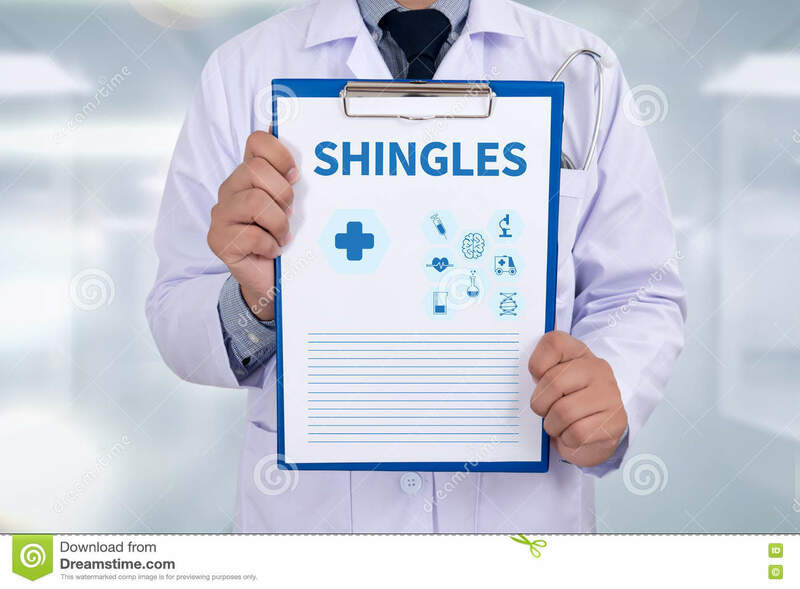 Antivirals are also effective in preventing complications associated with shingles, such as postherpetic neuralgia (PHN). PHN is a complication of shingles that leads to severe pain in the rash areas that can last months after the rash clears. A pain reliever can help control the pain associated with shingles. To help with itching, you can try putting a cool washcloth or calamine lotion on the rash. You can even try an oatmeal bath to relieve the itching. Cover the rash and avoid touching or scratching it. Avoid pregnant women who never had chickenpox, premature infants and individuals with weakened immune systems. What Can You Do to Prevent Shingles? The Centers for Disease Control and Prevention (CDC) recommends all healthy adults 50 years and older get vaccinated with Shingrix to prevent shingles. Shingrix, a new recombinant zoster vaccine, is a two-dose series with a second dose to be taken two to six months from the first dose. Shingrix is preferred over the older Zostavax, as it is not a live zoster vaccine, whereas Zostavax is. Also, Shingrix has been shown to offer longer protection against shingles and is recommended for people age 50 and older. Zostavax is recommended for people over 60. Discuss any additional questions or concerns about shingles with your health care provider.